Black Isle Regatta 2018 | Build it. Row it. Love it. 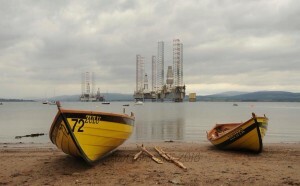 The village of Cromarty, at the mouth of the Cromarty Firth was the venue for this year’s Black Isle Regatta. The regatta is organised jointly by Avoch CRC (the Skiffties) and Cromarty CRC, with significant contribution from the wider local community. Those who arrived on the Friday were treated to a spectacular acrobatic display by a small pod of dolphins 100m off shore from the beachside campsite. The welcome from the dolphins was really reflected in the welcome extended over the whole weekend by the skiffies and townsfolk of Cromarty. Youth Race Underway with resting rigs in the background. Photo: JJ Wallace. There was an impressive turn out of Skiffs and Clubs. North Berwick and Eastern had travelled up from the South East and joined a very strong northern contingent. 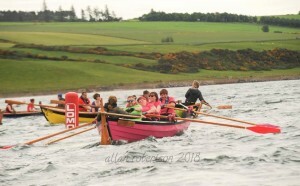 Host clubs Cromarty and Avoch were joined by fellow black islers Soutars Skiffies. From the North we had Golspie, Bunilidh and Orkney, with Coigach, Lochcarron and Ullapool coming over from the North West. The south shore of the Moray Firth supplied crews from Findhorn, Portsoy, Burghead, and Deveron. In addition to the club teams a spare skiff was supplied for a “Rest of the World” team, made up of those who were looking for a row, including for instance a few Broughty Ferry rowers who had washed up on the shore. The regatta was a feature of the Northern Circuit of the SCRA Youth Series. 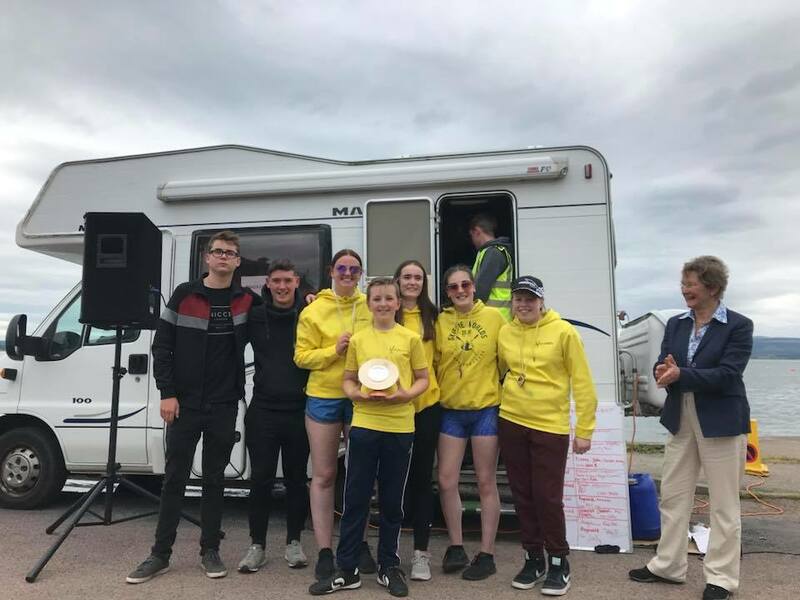 A full programme of six youth races was offered, with boys, girls and mixed categories in both under 19 and under 17 age groups. The youth races were on an out and back course parallel to the shore. 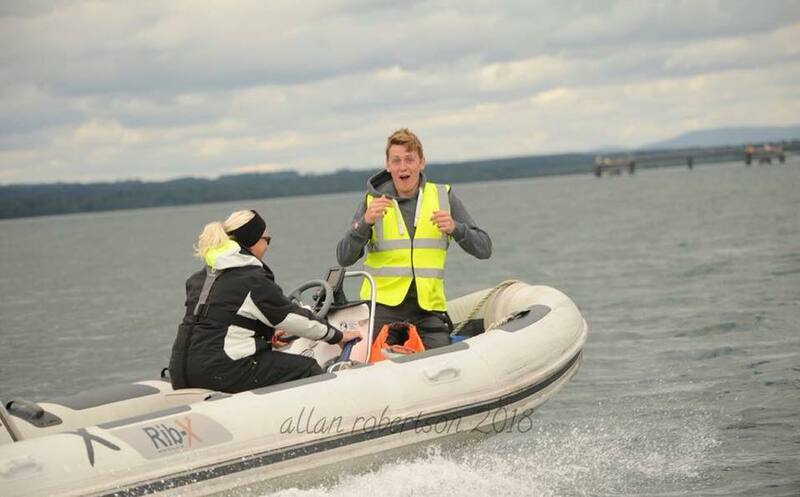 Up to eight crews raced in each of the categories, a very pleasing sight for those who promote the youth series. The weather was moist on the Saturday, but cleared nicely for the open air midsummer dance entertainment on the Saturday night, and was very pleasant on the Sunday. The course was triangular for the adult races, with a longer leg to the first bouy and an overall course length of 2250m. 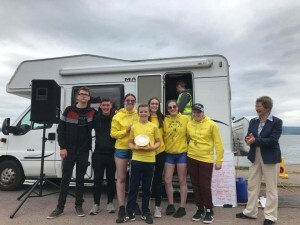 Strong tides run out the the Soutars, and tidal conditions varied considerably between races, keeping coxes guessing with regard to the best line. Getting to the first bouy in a position to make a clear turn was key, although especially midfleet there was overtaking between the two turns and on the last leg. Good coxing was rewarded (as long as the rowers did their bit!) 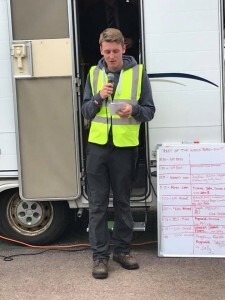 and there were disqualifications for some boats at the turn where their coxes had not managed to comply fully with the turning rule in the SCRA rules of racing. Just as a reminder while you are here, we have published useful guidance on the rule in the past.